After collecting all the Solar Pons stories by August Derleth into seven paperbacks (including one novel), in 1979 Pinnacle released an original collection of authorized Pons stories by horror and mystery novelist Basil Copper. This was the first. The Chase Continues . . . 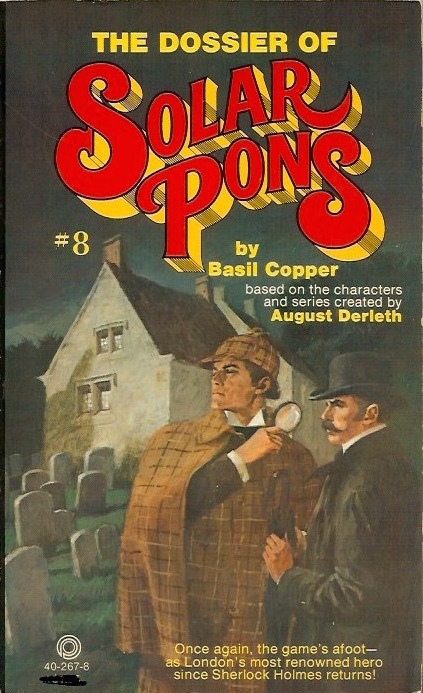 When August Derleth inherited the mantle of Sir Arthur Conan Doyle, he created in Solar Pons a detective whose genius cannot be matched––perhaps not even by Sherlock Holmes himself! Now the pen has passed int the hand of the noted British author, Basil Copper, whose superlative storytelling abilities will astound and delight the most discrimination dyed-in-the-woll aficionados of detection. Here are six spine tingling and superbly crafted tales of suspense in the best tradition of Solar Pons. Come, once again, to Number 7B Praed Street, where the inimitable and infallible master of the art of deductive detection awaits. Follow along closely as he sets apace onto the mist-shrouded cobblestones of old London's alleyways in chase of crime. But make haste! The game's already afoot! Also see: The Adventures of Solar Pons (1976), The Return of Solar Pons (1975), Mr. Fairlie's Final Journey (1976).